Growing up in India I remember it was hot in summer and, having no air-conditioning, we often slept on the roof of our house. I would spend endless hours staring at the brilliantly lit night sky and marvel at all the stars out there. My father was posted in the boonies in the state of U.P. in Northern India, building roads and other infrastructure for the Public Works Department of the government. Being in remote locations meant truly dark nights, unpolluted by town lights, and so the stars seemed ablaze like so many twinkling bulbs hung in the sky. You could see the Milky Way streak across a large swath of sky like a shimmering veil and you could spot some familiar patterns, such as the belt of Orion, night after night, rising and falling as the whole show rotated slowly in a giant circle around the pole. I was told by my mom later that, when six years old, I was fascinated by the stars and kept asking endless questions about them. What were they? How come they didn’t fall down. How long would it take to count them? And so on. My mom said they were other worlds, very far away, too numerous to count and that unknown, strange supercreatures lived on them. Aliens with superpowers perhaps, aliens who could see everything we were doing and could influence us through magic etc. My questions kept coming and my mom would answer them patiently and with wondrous touches until she dozed off, and I would keep staring and dreaming of these mysterious worlds beyond our reach. My fascination with astronomy has continued unabated. I still have endless questions, but now I realize that I am not alone. There are many, many others like me who are exploring the skies and trying to answer age old questions. And thanks to our great exploration programs and our collective will to find out more we have some fascinating insights into the Universe. I have been associated with SETI for a few years now and ever since I first visited them (See my blog from then, here) I have been blown away by the extent to which they are passionate about studying our universe and dedicated to collecting extra-terrestrial evidence of life. And now we have the fascinating Kepler Mission whose “number one goal is to find a habitable planet, a second Earth.” The Kepler probe is a large telescope in synchronous orbit with the earth always facing away from the Sun so that it can watch the stars at all times. It can see a small swath of stars and has photometry to detect planets indirectly from their small occultation of light as they pass in front of their stars. It is like flashing a small flashlight into the giant gloom of the universe – Kepler can see only about 100,000 stars in our outer galaxy neighborhood (up to 3000 light years away maximum), a mere 0.00005% of the total stars in the galaxy, which is only one of 100,000,000,000 estimated galaxies that are in the observable universe. 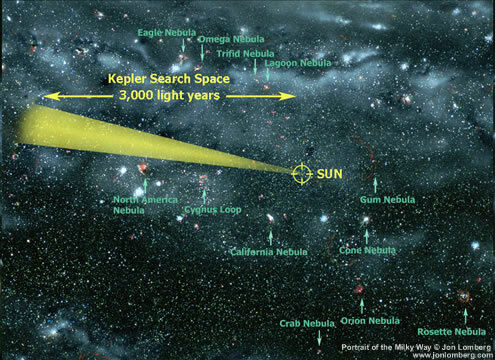 But Kepler is already giving us a great picture of what’s out there. See this great article in the Wall Street Journal from last Friday. 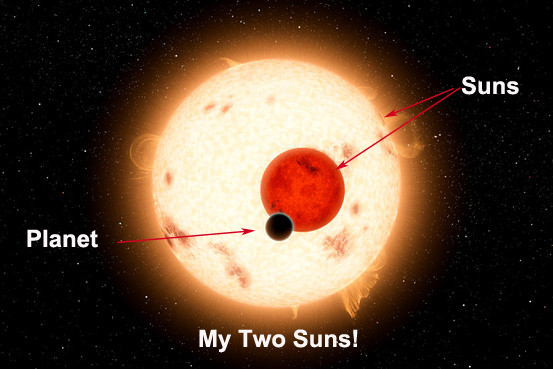 It has found 1235 candidates for planets rotating around other suns of which 54 are in the habitable zone. That means that 54 planets have been found which have conditions similar to earth and could sustain life. A Planet Circling two Suns. It found a planet that revolves around a two-star system! Two stars that themselves rotate around each other. Imagine multiple sunrises at odd hours of the day and multiple sunsets to serenade! See the great pic to the right. There are more planets than there are stars in the Universe! And we have 200 billion stars in our galaxy alone. It seems that most stars have planets and many have more than one. So let’s say we take a conservative estimate of 200 billion planets in our galaxy. From the preliminary analysis of the Kepler exoplanets it seems that about 4% of the planets are habitable and have the potential to generate life as we know it. That means that we could have 8 billion planets capable of life in our galaxy. So even if one such planet actually develops life out of 1000 we would have 8 million earths out there with life. If only 1 in 1,000,000 do we would still have 8000 earths in our galaxy with life. And since there are at least 100 billion galaxies out there …. well you do the math. Bottom line: It seems that we are not alone and exciting news is due from all the alien watchers any time now! By the way Kepler cost us $600 million. Government spending? I prefer to think of it as American Exceptionalism. This entry was posted in Cosmology, Current Events, Money, Politics, Science. Bookmark the permalink. Sometimes I wonder where we go for our afterlife from this earth. Perhaps to these other earths. Do others come to our earth? How do we know what’s “inhabitable”? And according to whose definition of “life”? Still too many questions. I like science to keep coming up with more new discovries and yes, I like your branding of this as American Exceptionalism. Inhabitable planets are defined as being capable of evolving life as we know it – so they have similar temperature ranges as earth, similar gravity and the possibility of sustaining water. “Life” right now is something like the life we know on earth. Replicating, evolving, self-organizing etc. As for afterlife issues there is much in what you say. Our consciousness can be cosmic and transferrable to other life forms in the universe. Maybe the reincarnation of souls is a continuity of emergent intelligence which does not “die” when a given human dies, but is reincarnated in ever widening life communities on earth and beyond. It is also possible that life on earth was initiated here by souls from other worlds, who started their exploration millions of years before us and successfully identified earth as a suitable place to seed their reincarnations. Anil, you raise a very interesting point. When it comes to journeying to other suns and their planets (that will take thousands of years to get to) how do we get there given our life spans? Various possibilities exist. We might be able to take a team of volunteers and adventurers like you, cryogenically freeze them, send them to such a planet along with tools, computers, half-a-million frozen embryos etc. and thaw them out when they get there. Thousands of years will pass, but the thawed people will think they just woke up from sleep. They can then build an extraterrestrial colony of earthlings. In an evolutionary context a few thousand (even a million) years is nothing. Early humans evolved 2-5 million years ago on earth and life is 4 billion years old. So in a few thousand years we start inhabiting other solar systems and in a million years we could colonize most of our galaxy. This kind of explorer adventurism is in our blood. That’s how Columbus sailed forth as well as Magellan, Hudson, Amundsen and the like. There were many false starts and many perished but eventually we colonized most of the earth. The next frontier could easily be space. you are a great writer…keep going with your pen…and do add your camera to it…this comes in time as i just start writing a video game for my own fun about searching the outer space for life. i only wish i can finish it and share. Can we not add multiple universes to 100 billion galaxies? Really the question is why have ETs not found us? Mashru, you’ve taken this discussion to a higher level! Yes, of course the “Universe” is probably even larger than the “visible” universe to us and there are postulated to be uncountable multiverses. Who knows what kind of “life” might exist there. Certainly we could have life teeming all over the cosmos – an exciting possibility. Why haven’t we been contacted yet? Great and perennial question. Two possible answers are: 1. Those trying to contact us are so far advanced that we don’t recognize their signals. Imagine 200 years ago we wouldn’t recognize radio signals. Maybe there is some higher technology these aliens are using that is undiscovered by us (yet). 2. Maybe we exist as a life form created by them and they are watching us as if in a lab and masterminding our evolution for their own ends. Any contact with aliens will be asymmetrical and we may not easily see it. The third possibility that we are the only civilization advanced enough to even consider reaching out to others seems statistically unlikely. Really liked your blog that touches upon what i think is the ultimate question ! As an extension to your 3rd possibility … i often get reminded about ‘Flatland’ and its creatures. I get a good laugh comparing Flatlanders there with us humans. We just maybe have no clue. This is an amazing thought. Veer well written and makes one think deeper. I hope we can find some alien life during our lifetime. They may be around, but since we do not know what form they are, we may not be able to identify them easily. I found the thoughts very imaginative but not answering the basic question of cosmology and consciousness? We are only 3 dimensional creatures may be there are others with ability to live and see things multidimensional?